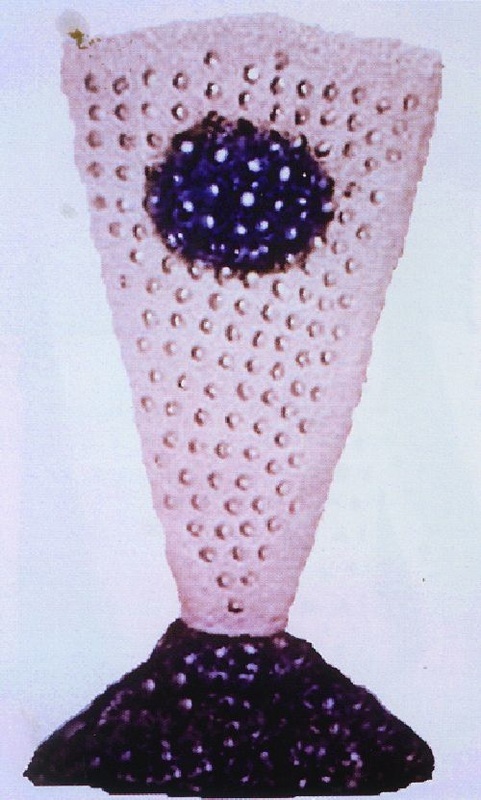 Reproduced from Gault, R., (2004) Success with large Scale Paperclay Porcelain and Beyond Ceramics TECHNICAL , 18 (1), 99-103 with permission from Rosette Gault and Editor Janet Mansfield. An update from the studio of Rosette Gault, the first in a series. 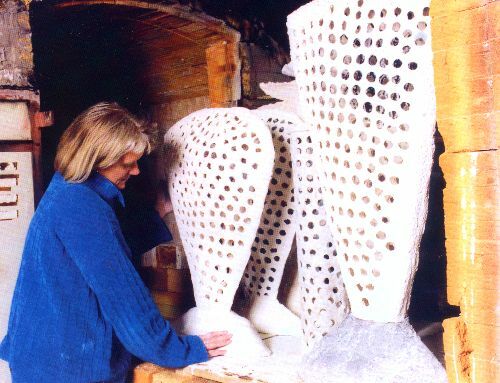 Rosette Cault places paperclay forms in the kiln. Despair. An aerial view of a cloud captured in a birdcage of Creek idealism. From the series Perforation. 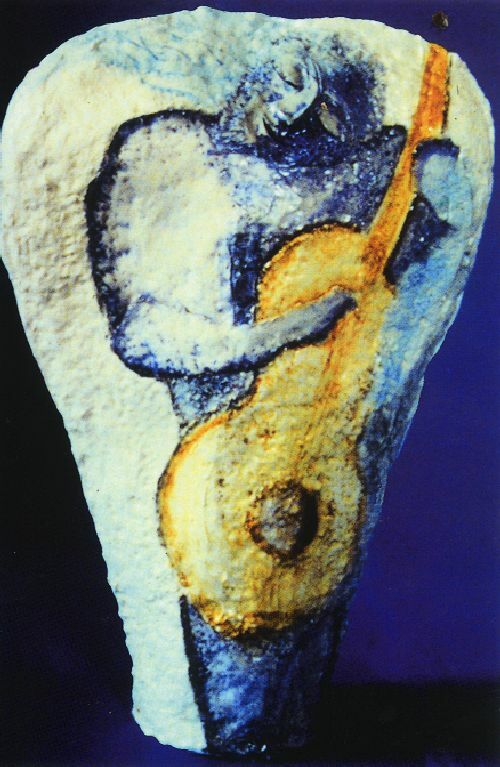 Exhibited at Banff, 1998. Musician - String Bass. 1998. High- fired earthenware paperclay (Rosetta Stone recipe). PAPERCLAY FOR LARGE SCALE FORMS allows more time for an artist to work and engage directly. Modelling, carving, changes of mind, surface treatment, and so forth, may continue at or over the bone-dry stage. Even thin-walled irregular green-ware paperclay bone dry shapes are easier to handle. The risk of loss to the form pre-fire is far less because the green strength of a paperclay is nearly double that of usual clay bodies. Most fractures or accidental damage can be repaired before the first firing no matter whether the clay is dried out or not. Opportunity to work after the bisque is a possibility, though the chance of repair success at that stage is somewhat less than it is over the bone-dry green version. Indeed, if you add enough paper pulp, the final fired result is also lighter in weight. These benefits give my imagination licence to play. I put my attention toward what matters in the artwork and the idea itself rather than struggle with the limitation of traditional clay for projects of large scale. Some visions do not succeed with a traditional approach or a traditional clay body no matter how much grog, sand, chamotte or nylon one might be tempted to add instead of paperpulp. This article win outline ideas that have proven to be the key to the assembly and firing of large-scale porcelain paperclay sculpture whether it is formed by building up or carving down. First, I had to be wining to give up a few stubborn habits from using traditional clay in order to find what worked best and fastest. I wanted alternative methods to coil building, ways to achieve large thin upright forms in paperclay that were reliable and consistent with high fire. With large paperclay pieces, protecting the forms with wet towels or under wraps of plastic between work sessions hides the structural truth. This habit blinds the sculptor from learning precisely where and what adjustments will be needed to make. Plus, the procedure of slow drying so necessary for traditional clay takes more time. Further ahead, I will explain how the natural shrinkage of paperclay can be the key advantage to fired success compared with the non-shrink sculpture bodies. Assembly of parts at leatherhard requires far more time and complication than assembly of the equivalent parts at bone dry. Most pre-assembled large-scale leatherhard structures are not immune from movement and warping compared with their equivalents assembled at bone dry. Better control of movement in the final result and there are more chances to change and test for secure joins before it is too late. Paperclay, at bone dry, is water absorbent. Bone-dry work can be dipped in glaze and still hold its shape long enough for evaporation and uniform glaze adhesion to occur. Bisque fire used to be the only way to make conventional clay absorb enough water from the glaze to cause a uniform deposit of glaze on the surface without losing its shape. Single fire saves time and fuel cost. However, when I do bisque a high-fire porcelain or stoneware paperclay I take it to cone 04 rather than cone 08. Just that little difference may save a high pulp thin walled bisque paperclay from accidental crushing in your hand after fire. CONSTRUCTIONS WITH POPCELAIN AND FINE GRAINED CLAY. This article reports results of my experiments to date with both additive (building up slab construction) and subtractive (that is, carving from a solid chunk) methods with large scale porcelain and other paperclay sculptures. The first section of this article explains the results of building about a dozen irregular thickness yet relatively thin walled (less than 0.2 cm in places) large-scale freestanding work 1.2 m (4 ft) tall from paper clay pure porcelain slabs with no grog or other refractory added. In addition I have tested a similar number of works in a ball clay /talc earthenware paperclay. The second section of this article explains what I learnt about carving down and modelling large solid chunks of paperclay porcelain at both soft and bone dry states. Paperclay porcelain combines easily with the light-weight fillers - perlite and vermiculite - to give an extra textural contrast to the smooth porcelain version. Plus this perlite paperclay porcelain: (RuffRock) is now a favourite lightweight filler choice to support thin slabs or weak areas of super smooth paperclay porcelain through to high fire. For this set of texture work, I was more interested in thickness and compatibility of Ruff Rock to Pearl bodies at high fire so I have not made made giant works of Ruff Rock as yet. Perhaps a daring reader will examine giant Ruff Rock in more detail in the future. New editions of my books about paperclay explain also the sand cast mould and construction methods I have also been exploring in recent years. My early experiments of large-scale tests were high temperature firing of a typical low-fire earthenware body (Rosetta Stone). I constructed a dozen or more earthenware figures and fired them kiln by kiln. Each one was single fired. I deliberately overfired these to cone 4 to 6 even though the ball clay/talc (50/50) casting slip body is rated at cone 04. Without paper traditional earthenware clay structures without any refractory such as grog, etc, start to collapse at about cone 1 and by cone 4-6 melt drown to a useless puddle of nondescript stone-like glass. In contrast, my paperclay version of earthenware (Rosetta Stone) stands tall. The fired result resembles a white stoneware in hardness and feel at cone 4. At around cone 6 or so, depending on the thickness of the walls of the form and the even temperature in the kiln, some figures started to slump or warp. If my approach might work as well for your work, test an earthenware clay for its suitability for high fire as a paperclay. Those of you who put red iron in earthenware will have to bring the temperatures down at least two or three cones because the iron may have a melting effect at temperatures in this range. After success with the low-fire versions of large shapes, I built another dozen shoulder height forms in my favourite porcelain for trials by high fire. Again, no grog or any additive other than the pulp was in my base recipe. I planned to put the forms to the maximum handling abuse and break as many rules of construction as possible to find the edge of possibility before collapse. I had been humbled by a kiln load of warped porcelain paperclay in forms overfired during a residency in Bechyne, Czech Republic, in 1996. Rather than blame the overfired, I wondered what other information could be gleaned from this loss. Was it the paper? No. Might the warping under stress have something to do with my assembly method? Perhaps I wanted to sculpt more than I wanted to align my intention with the natural properties of clay. Paperclay allows me to assemble at bone dry by a variety of means. Two (2) medium buckets (use same size buckets to measure this) prepared white earthenware base (rated cone 04-05) or buckets of standard prepared casting slip rated for cone 06- 05. One (1) medium bucket (same size) of wet strained bulk of pulp plus or minus handfuls and inches. Torn paper from 10- 12 rolls of bargain-priced toilet tissue is equivalent to about eight bulkier rolls of deluxe brands, but don't try to make this pulp in this same bucket. Use giant barrels, not for beginners to try. Avoid lumps and clumps. The above is my high-fire low-fire high-pulp all purpose, any kiln, any time, sculpture recipe for many years. Texture before firing: Smooth, putty-like. Takes underglaze, slip, engobe, stains, etc. Texture bone dry: Absorbs water when dipped. Takes underglaze, slip, engobe, stains, glaze, etc. Thin walls soften a little when soaked a while. Slakes down overnight or sooner. Sinter Fired: Carves off in fine powder. Texture after fire: Smooth, white, the higher you fire it, the more dense and hard the fired paperclay body feels to touch after cone 4. Low-fire texture - Cone 03 to 04.. Too hard to carve by hand but use power tool. Can treat surface with any and all commercial glazes, opaque or transparent underglazes, overglazes, etc, and refire if desired. Normal slips, engobes, stains work well. At this temperature, the result is a soft normal earthenware. Vessel will seep water without a finish gloss glaze or other sealant. Mid Range (Cone 4 to 6): Hard as a rock. Resembles white stoneware. Resists water but may not be 100 per cent watertight. Suitable for outdoors in frost and thaw too, glazed and not glazed. Raku: Good anytime- bisque to 04 or more, until you are experienced in fire. When one knows the kiln, the fuel, the tools, the tongs, how the shapes heat up, and where best to place them, bone-dry single firing works. China Paint, Gold, Silver and Metallic Lustre, Decal Fires: cone 032. Best to apply over already fired gloss glazes in multiple Fires. Base Clay Options: if you substitute an iron bearing red terracotta blended clay as base for the earthenware base, it fires red to brown. Stick to the recommended lower temperatures cone 05-02. A heavy red iron concentration acts as a melting as well as colouring agent. Test first if you fire red iron-bearing terracotta or maiolica-type paperclay beyond cone 1. Two (2) medium buckets of prepared porcelain (cone 10) high-fire casting slip. Thin areas become translucent at cone 8. Dare to fire to cone 10 only if walls are thick enough and other factors mentioned, indicate the structure is stable and built well. When mixing batches in the studio, avoid or minimise airborne dust clouds. Start with buckets of prepared liquid casting or pouring slip rather than bags of dry-blended powdered clay. Texture bone dry: Absorbs water when dipped. Thin walls soften a little when soaked for a while. Slakes down overnight or sooner. Takes underglaze, slip, engobe, stains, glaze, etc. Texture after firing: Super smooth. Sinter fire: Carves like soft soapstone, dense, but still easy to handle. Biscuit fire: At cone 08 may be quite soft, handle with extreme care. Carves like a dry cosmetic-grade sponge. At higher bisque, cone 03, it will be possible to carve. Does not slake down in water. High Fire (cone 8 to 10): Hard as a rock. If thin walled fire to cone 8 and play it safe. Serious heavy duty power tools are needed to alter the surface at this stage. It would be far easier to work surfaces before high fire. Base Clay Options: If you substitute stoneware throwing clay as base for the porcelain – paperclay fires tan to brown. Reduction or oxidation atmospheres. Raku: Good anytime. Bisque to cone 03 or more first. When one knows the kiln, the fuel, the tools, the tongs, how the shapes heat up, and just where best to place them, bone-dry single fire is realistic. China Paint, Cold, Silver and Metallic Lustre, Decal Fires.. cone 032. Best to apply over already fired gloss glazes. 1/2 medium bucket granular perlite, plus or minus handfuls or scoops as needed. Perlite is found at gardening suppliers and has a good affinity to high pulp porcelain paper clay and it fires white. The more perlite you add the more crumbly and non clay-like the body seems, and is. If a lot of perlite is added, the mass has to be packed tightly until it sets.. Substitute vermiculite if white at high temperature not important. This is a variation on Porcelain Pearl with perlite added so it is short and fires light too. I like it for a lightweight ceramic putty filler and in the interiors behind super thin Porcelain Pearl slab shells for stablilising vulnerable areas of large scale forms. Carves like frozen chunky peanut butter. Texture before firing: Short when moist. Takes underglaze, slip, engobe, stains, glaze, etc. Texture bone dry. Absorbs water when dipped or sprayed. Softens, then slakes when soaked over time. Texture after fire: Surface has openings like a coarse utility sponge, irregular granulated pock marks, lightweight, strong, if fired to the right temperature. Sinter fire: Carves like frozen chunky peanut butter. Biscuit fire. At cone 08 the work may be soft; handle with extreme care. Carves more like a dry kitchen sponge, At cone 03 it is possible to carve. Takes underglaze, slip, engobe, stains, glaze, etc. High Fire (cone 8 to 10): Hard as a rock. Serious power tools needed. Gloss glaze to resist moisture. Base Clay Options: If you substitute stoneware throwing clay as a base for the porcelain-fires tan to brown. Raku: Good anytime, Bisque to cone 03 or more first. Mien one knows the kiln, the fuel, the tools, the tongs, how the shapes heat up, and where best to place them, a bone dry single fire is fine. China Paint, Cold, Silver and Metallic Lustre, Decal Fires: fire to cone 032. Best to apply over already-fired gloss glazes. Rosette Gault is an authority on paperclay and has written a number of books on the subject. This article is the first in a series by Rosette Gault on the use of paperclay for large scale works. More paperclay recipes are in the recent editions of her books. Detailed description and illustration of clay additives as well as the application of colour are to be found in her forthcoming book to be published by A&C Black in conjunction with other publishers.